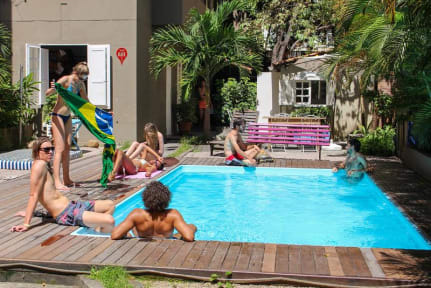 Located in the most beautiful and exclusive neighborhood in Rio, only one block away from the metro station, Ipanema Beach House offers you the best location of the city, one of the hippest corner in town. In Rio location means a lot... Stay steps away from the beach and at night enjoy the best nightclubs and bars, all within walking distance. The house itself is a historical landmark. A former private home filled with large rooms, balconies, hammocks, an outside area with a nice pool, and the most helpful staff around. You will not want to leave!! Everyone speaks English, and are prepared to give you information and local tips. The staff prides itself on creating a welcoming atmosphere. This is a special place where friendships are made! Feel free to leave your bags at our storage room, if you want to have a look somewhere else around us before checking in! It will be a big pleasure for us even if you dont stay there, and you will be anyway, very welcome to come to our bar and have a drink where you can meet a lot of backpackers and Brazilian people!